I’ve posted a couple of times in the past about the potential for using copper in the built environment to limit bacterial growth and/or pathogenicity (e.g. here and here). I’ve heard and read things about copper which cover the whole spectrum from “it’s a magic bullet” to “snake oil”. I’m guessing it’s somewhere in between, though I have seen some convincing lab data about the effect of copper on microbes. The bigger question comes when that copper is in a real building, exposed to air, chemicals, repeated touch etc. 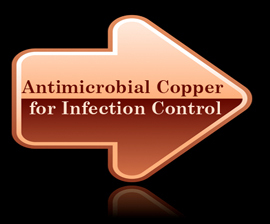 Enter this very interesting study from the UK looking at the “Health economics assessment of antimicrobial copper for infection control” in ICUs. Since I can’t find the actual paper, I can’t dig into whatever assumptions they used about the efficacy of copper. But I like the fact that they’re looking at the economics of the whole thing which is what a lot of infection control really boils down to in the end.